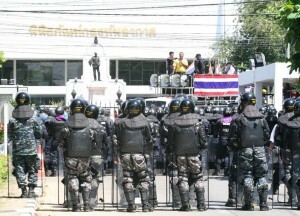 The army has threatened to declare martial law if widespread violence breaks out in Thailand. 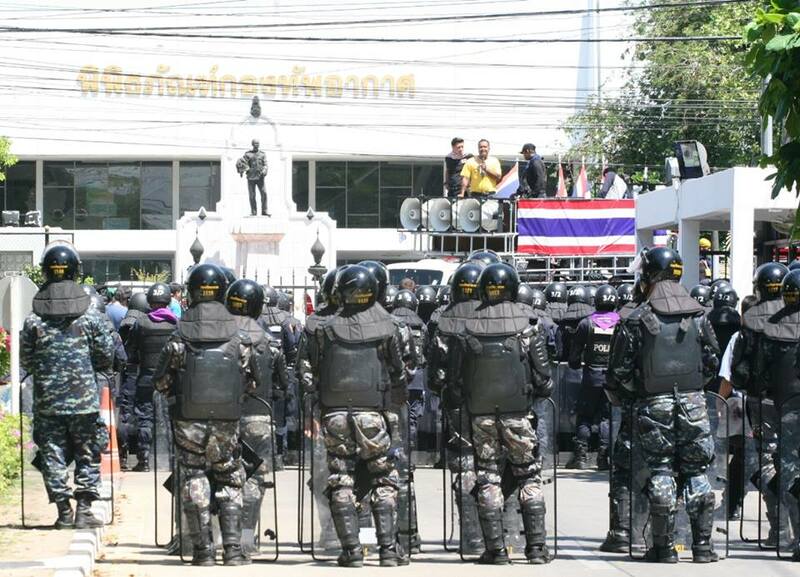 The comment followed yesterday’s statement by the Royal Thai Army, which expressed a willingness to deploy troops and take “extreme measures of suppression” if shadowy militants continue to stage attacks on demonstrators. Anti-government protest campsites have been the target of numerous attacks from unidentified assailants in recent weeks. The latest incident killed three demonstrators and injured at least 20. Many observers interpreted yesterday’s army statement as a threat to impose martial law, which a spokesperson of the Internal Security Operation Command (ISOC) confirmed today. Col. Banpot Poonpian cited Articles 4 and 7 of the Martial Laws Act as the legal basis for the commander-in-chief’s authority to unilaterally impose martial law in the event of social unrest. If invoked, martial law would grant the military “superior power over the civil authoirty” in matters of maintaining public order. It would permit the military to censor the media, announce a curfew, and “burn any house or thing which may be useful to the enemy,” among other powers. According to Col. Banpot, the statement released by the army yesterday was meant to be a “warning” in accordance with legal provisions, and not a provocation in any way. He also clarified that martial law would only be invoked if there is widespread use of “military-grade weapons” against members of the public. The spokesperson added that the Internal Security Act imposed by the government is adequate to oversee the situation for the moment. Col. Banpot also criticised the anti-government demonstrators for causing violence, such as the numerous assaults committed by their guards and a recent attempt to ram vehicles into military personnel at the Royal Air Force headquarters. “These [incidents] have made it difficult for the security forces to operate, and the public is affected,” Col. Banpot said. On the other hand, Col. Banpot noted that the demonstrators are frequently subject to attacks from unidentified groups at night. “This is the problem that the [government] has to fix,” Col. Banpot said. When a reporter asked whether the invocation of martial law would lead to a military coup, Col. Banpot replied that it should only be seen as a “strong medicine” that has nothing to do with a coup. Col. Banpot refused to provide a clear answer to the allegation that the Senate is considering army chief Gen. Prayuth Chan-ocha as a candidate for an unelected interim Prime Minister. “Is there any [legal] channel or legitimacy to that? Will every side accept that? These questions alone are the answers in themselves,” Col. Banpot said.